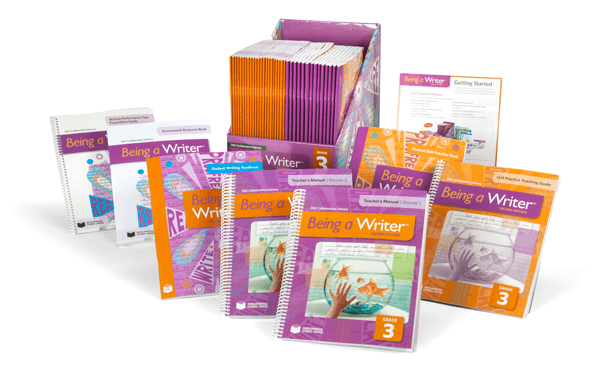 The Center for the Collaborative Classroom’s Being a Writer is a supplemental language arts resource for students in grades K-6. Resources are available in print and online formats. Instruction focuses on developing skillful, creative writers and socially adept learners. At grades K-2, Being a Writer addresses students’ ability to communicate stories by drawing, telling, and using written letters, words, and simple sentences. Instruction at grades 3-6 addresses the writing process (i.e., drafting, revising, proofreading, and publishing) and specific genres of writing. Being a Writer focuses on developing writing and social skills. Writing instruction is supported by the “6+1 Trait Writing Model” that emphasizes seven traits of quality writing: ideas, organization, voice, word choice, sentence fluency, conventions, and presentation. Across grades, students learn to communicate their ideas logically and with creativity and expression. Social development is addressed through the use of “Cooperative Structures,” such as brainstorming and small group and partner activities. Cooperative experiences teach students to work collaboratively and to treat others with care and respect. Being a Writer encourages teachers to grow as writers and as collaborators (i.e., with colleagues) and includes extensive training in teaching writing content and using program resources. Teacher materials support work in teacher teams and professional learning communities.